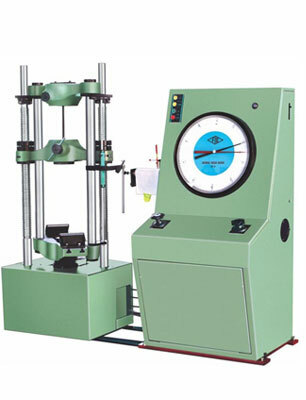 FIE Universal Testing Machine is designed for testing materials and other materials under tension, compression bending, transverse and shear loads. This consists of a hydraulic cylinder motor with chain and sprocket drive and a table coupled with the ram of the hydraulic cylinder, mounted on to a robust base. The cylinder and the ram are individually lapped to eliminate friction. The upper cross-head is rigidly fixed to the table by two straigh columns. The lower cross-head is connected to two screwed columns which are driven by a motor. Axial loading of the ram is ensured be reveling the cylinder and ram of of any possible side loading by the provision of ball seatings.